The rationale behind The Coconut Diet is based on research that compares the coconut-rich diets from the South Pacific cultures to the standard diets eaten in the western world. The Coconut Diet claims that the addition of coconut oil to an eating regimen similar to the Atkins Diet will speed weight loss and even enhance thyroid function. Like the Atkins Diet, the Coconut Diet takes dieters through four phases of a low-carb eating plan. The one major difference is the daily addition of 2-3 tablespoons of coconut oil to your caloric intake. Just like the Atkins Diet, phase one of the Coconut Diet is the strictest in the amount of carbs allowed. Phase 2 centers on detoxification of the colon and other vital organs over a four week period. Phases 3 and 4 reintroduce carb intake and teach the dieter how to maintain weight loss. In the first three weeks on the Coconut Diet, the plan allows for eating foods like chicken, turkey, fish and other lean meats along with similar protein-rich foods like eggs, cheese and nuts. Along with the 2-3 tablespoons of coconut oil, the diet also promotes drinking up to ten glasses of water each day. Specifics for Phase 3 will depend on personal detox goals. 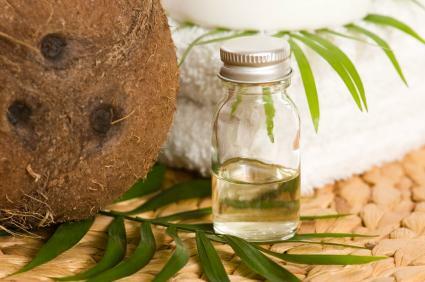 Something to consider before trying the Coconut Diet is the fact that coconut oil is rich in saturated fat. In fact, most of the Coconut Diet's food recommendations are sources of saturated fats which are found in food products derived from animals. Saturated fats, along with trans fat, are proven to raise cholesterol. High cholesterol is listed among the major risk factors for heart disease and stroke. According to the American Heart Association, "Saturated fat intake should not exceed 7 percent of total calories each day." Losing weight and living thin does not always equal good health. Our bodies are designed to live and grow on a diet of balanced nutrition. Focusing a diet around one single food raises red flags when it comes to good health, even if that one food is a healthy choice. The types of dietary fat incorporated in your daily diet along with your level of physical activity affects your overall health including blood cholesterol levels. Dietary fat obtained from food sources, mainly vegetable sources, is an essential part of a balanced diet. It promotes growth and development. But before considering the Coconut Diet, remember the Heart Associations recommended 7 percent when it comes to saturated fats. Before starting a diet, check with your health care provider and discuss their recommendations. It is best to avoid getting caught up in a fad diet that can hurt your long-term health. And no matter which diet you use, incorporate regular exercise as part of your routine. Aerobic exercise keeps your heart strong and helps keep cholesterol levels in a healthier range. Choose something you like to do like walking, jogging or riding a bike. If none of these interest you, be creative and try something like line dancing.